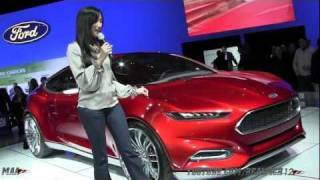 Ford Evos Concept makes global debut at the 2011 Frankfurt Auto Show. 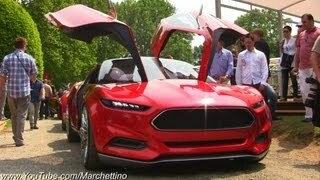 The Evos Concept is a four-seater fastback hybrid concept with gullwing doors showcases a powerful sporting stance. Driver engagement technologies explore seamless enhancement of the driving experience, driver well-being and smart, electrified powertrain. Berlin, Germany, August 31, 2011– Making its global debut at the 2011 Frankfurt Motor Show in September, the Ford Evos Concept represents the ultimate expression of Ford’s new global design language, and explores key future powertrain and vehicle technologies. "Our goal is to focus on enriching a customer's every experience with their vehicle – by personalizing it, adapting it, and creating unique, unexpectedfeatures that surprise and delight them," said Kuzak. "In the Ford Evos Concept, this objective is explored and extended to the area of connectivity, where the intent is not to convert the vehicle into a smartphone, but rather to provide personalised and safe connection to the outside world in an enriching manner designed totally for the vehicle context." The concept’s technology experience embraces a new generation of driver interaction and awareness currently under development in the Ford Research and Innovation laboratories.Seamless connectivity between the vehicle and the driver’s ‘personal cloud’ of information is at the heart of the vision for its capabilities. Ford researchers are focusing their efforts in this area to deliver on four key customer benefits: personalisation, seamless enhancement of the driving experience, looking after the driver’s well-being and delivering smart electrified powertrain optimisation. Drawing from a detailed understanding of the driver’s preferences and driving habits, the Ford Evos Concept combines this personal information with additional data from the cloud, such as the driver’s work schedule and local traffic or weather conditions. This information provides a personalised and seamless experience as the driver transitions in and out of the car. The new global design DNA provides the company’s worldwide design teams with a common framework to guide the creation of new products, enabling them to shape a coherent family of distinctive vehicles sharing the same fundamental design character. “Our exciting new design DNA has been developed and refined by an intensive effort by all of our talented global design team," said Mays. "As a team, we wanted to create a more technical design vocabulary to help communicate the smart technology that is now core to the Ford brand.In addition, we worked particularly hard on meeting the high-expectations of a new generation of buyers – a group of consumers who have grown up surrounded by beautiful, premium design work on even the most affordable products." The concept’s spectacular hinged gullwing-style doors, both front and rear, provide outstanding access to the spacious four-seat cabin. Shaped as the ultimate expression of the new design DNA, the Ford Evos Concept highlights key elements of Ford’s distinctive new global design language. Bold, technical shapes, such as the extremely slim ‘laser cut’ front lamps or the dramatic graphic created by the front and rear screens connected by the thin glazed section of the roof, add a distinctive character to the design.Sculptured flanks highlight attention to detail on the surfacing, which lends a refined quality and a tauter, more muscular character. “The Ford Evos Concept embodies the core elements of the new global design language, while capturing the dynamic, fun-to-drive spirit which is central to the Ford DNA,” said executive design director Martin Smith.“Most notable is the brand new ‘face of Ford’, with its higher mounted trapezoidal grille, and the design is characterised by the use of very bold, technical graphics.We have also created much more refined and precise surfacing, and these elements together give a strong visual sense of premium quality. Reflecting the fun-to-drive spirit of its exterior design, the interior of the Ford Evos Concept is built around the driver.A stylish and innovative cockpit promises new levels of driving pleasure and driver interaction. The interior architecture features clean and simple surfaces, with a muscular, athletic character to the slim upper instrument panel, enhanced by bold trapezoidal cut-outs.Contrasting these muscular forms, curvaceous cockpit display surfaces sweep down either side of the driver, providing secondary information about vehicle and infotainment systems. 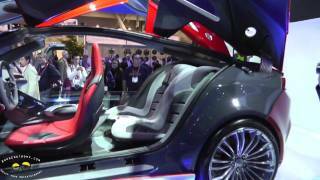 The concept features a bold red driver’s seat and the vision of unprecedented driver interaction via an advanced driver interface. The two rear seat passengers get an equally special experience, with dedicated touch-screen displays to interact with the vehicle and individually adjustable sports seats. 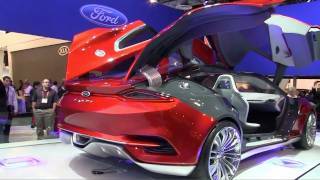 “Both the exterior and interior of the Ford Evos Concept clearly communicate that this is a driver’s car, so that as soon as people see the vehicle, they will immediately want to get in and drive,” said executive design director Moray Callum.